It’s time for the concluding episode of The Returned which begins with just about everything falling apart. The soldiers pretty much give up trying to do anything about the Returned after the big escape last week – especially when the priest tells their leader everything and he, rather shellshocked, decides to side step the whole issue and let any further return they’ve gathered go (apart from anything else they’re creepy). Simply because he has no clue what’s happening or what to do. It’s actually pretty well done and not as simplistic as it sounds – he steps back from a situation that has pretty much shattered all he knows: he falls back on the words of a priest who simply tell him to help. And with the dead rising, a priest isn’t exactly an unreasonable person to talk to. We have lots more foreshadowing of Victor’s specialness: both Lucy looking for him 35 years ago when she first came to town (further adding her as one of the leaders of the mystery) and Victor returning to his dad after being murdered. Something of a shock for papa, but he hid the boy for all those years drawing the spooky spooky pictures that predicted just about everything that happened in the show to date. Victor didn’t age in those 35 years, but his dad did and, eventually died. 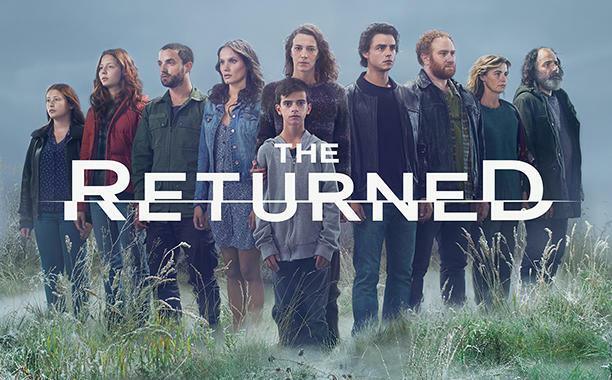 The Returned all gather from various places (except Serge who has committed suicide in the tunnel where he stalked his victims), Camille saying goodbye to her family, leaving them sad… but content (after coming back from the dead again), Lucy and her Horde, collecting Victor from Julie (who stays behind when Victor begs her to), Mrs. Costa (reunited with her husband, this time in love not confusion), Milan, Federick (presumably newly returned) the whole horde. Except Adele and Simon who go into the caves, where Adele meets waterlogged zombies and changes into a rather impractical and faintly Greco-Roman looking dress. They arrive at a giant sink hole where Victor tells Lucy that Nathan (Adele’s child) is like him – and must be looked after. And, of course Julie joins them, despite Victor begging her to stay away. She says she can’t live without him – and jumps in the sink hole… sort of, since Victor’s not having that so he teleports them book to a lake bank instead – the sink hole has turned into a great big puddle. And everyone else vanishes leaving Victor and Julie to go home… and seem to have a happy future with Ophelie. While Lucy who hasn’t vanished, dumps baby Nathan on someone else’s doorstep. The dam and the flood? Serge, Toni and the serial killing? Audrey eating her mother? Milan and the cult? Baby Nathan? Zombies rotting when separated? Victor’s numerous appearance in numerous places? WHY WHY WHY WHY? It isn’t that this show ended on a mystery – it’s the fact it ended with the strong impression it HAS ended and everything has been resolved when it has resolved not one damn thing. I legitimately feel like I have completely wasted the hours I’ve spent watching both seasons. I’m sure there’s a very highbrow and artsy reason for all of this. And I can’t fault the atmosphere which was amazing and I can’t fault it. And I certainly can’t fault the emotion or the acting. But the world building is non existent, the plot is non-existent, the development shaky – honestly this show takes the PRIZE for Madlibs. Gold medal right here. But, that’s not a homophobic trope or poor treatment of the characters, I admit – because no-one and nothing on this show has made sense. God child comes to Earth and does random stuff without quite understanding in a town of people in apparent 21st century France who are about 2 minutes away from Medieval witch burning. Maybe it’s just gone all over my head, but I’m bemused and frustrated but this non-ending.